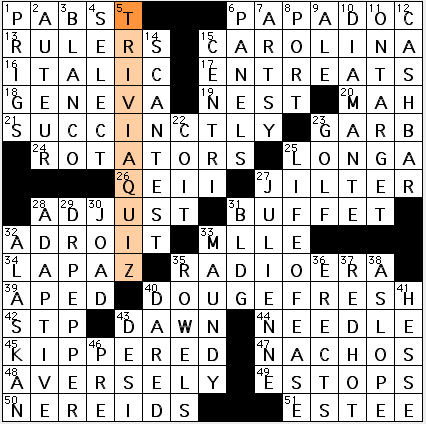 The daily-sized puzzles in the NYT this week were all made by students at Brown University. Some of the names in the bylines will be familiar and some, like today’s, belong to debut constructors. It’s particularly cool to see crosswords by young women, after too many years in which all the teen/young adult constructors were male. 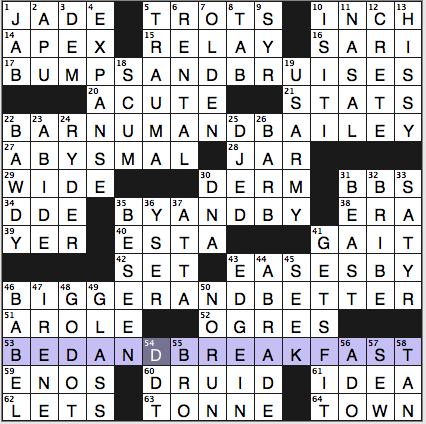 According to Jim Horne’s Wordplay interview with Aimee, her crossword mentor is Andrea Carla Michaels—I know from experience that working with more experienced constructors is a wonderful way to learn the craft of puzzlemaking. If you’re a young wannabe constructor but you don’t have the support of a college crossword club or a mentor, join Cruciverb-L and make personal connections with constructors via the crossword blogs, and you can find a mentor of your own. The fill is fun: EPSOM salts and EPSON printers, the BLACK SOX crossing BROWN, the paleontologist’s SKELETON and DINOSAUR, and Homer Simpson’s PORK CHOP are especially good. 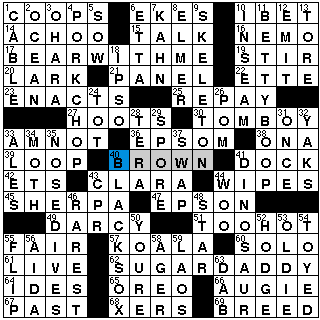 Tune in tomorrow for another Brown student’s crossword. Dang, would you look at that? Four 15-letter theme entries plus a 7-letter one in the middle means an ambitious 67 theme squares in a Monday puzzle. The grid pattern provides only a skinny space in the middle (at DNA) connecting the upper and lower halves, which potentially could slow a solver down. But the theme and overalll cluing are, I think, so accessible that the center squeeze shouldn’t be much of a problem. 17a. BUMPS AND BRUISES are [Consequences of a minor accident, perhaps]. 22a. BARNUM AND BAILEY are [“The Greatest Show on Earth” promoters] in circus history. 35a. [Before long] clues BY AND BY. 46a. [Product improvement slogan] clues BIGGER AND BETTER. 53a. 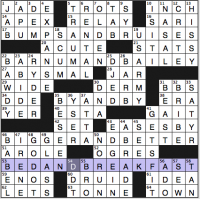 A BED AND BREAKFAST is a [Cozy inn whose abbreviation is a hint to this puzzle’s theme]. It felt a little awkward to me to have EASES BY (43a. [Gently slips past]) and EDGE IN (43d. [Enter stealthily]) together, especially with BY AND BY so close to EASES BY. So often the EDGE and EASE verbs are clued in similar ways and they both start with E, leaving me in a “What do the crossings say?” situation. Bright spots in the fill include the BAWDY BABEL BARB BEAST BRIBE, the U.S. ARMY, and a HISSY fit. Not much else of note, which isn’t unexpected when a dense theme constrains the fill. 17A. CHAIN OF EVIDENCE [Courtroom trail proving guilt or innocence]. This and “blood trail” feel very Law & Order to me. Lynn makes reference to a different kind of “court,” however, when she gives us the clue [Civil rights promoter with lots of court experience] for tennis court star Arthur ASHE. 28A. CHANGE OF PACE [Welcome shift in routine]. Like a vacation. Hiking… Or being by the sea… Taking some time for yourself can really take the edge off the same-old same-old. 50A. CHICKEN DANCE [Musical activity with clapping and flapping]. A change of pace on the dance floor, although to judge from the Lawrence Welk version, a rather tame one… Not to be confused with the, well, more expressive dance step from the late ’50s known as “The Chicken.” Nice how Lynn also finds a place in the grid for the chicken‘s mom, the HEN, a [Cooped-up female?]. If you’re in need of retail therapy, you can [“Shop] TIL [you drop“]; perhaps buy a TEXT [Start-of-semester purchase]; and never leave home, because the goods you want you [Shop for on-line, maybe] ORDER. I was a little surprised that [Cousteau family’s milieu] gave us OCEAN and not LA MER, but either way, that fill makes for the literal counterpart to the metaphorical AT SEA [In deep water?]. A range of mental/cognitive processes are represented by way of NOTION [Belief], then [Wishful thinking?] for ENVY, then MENSA for [Bunch of wise guys?]. My first response to that last one was MAFIA (with MAGES as a possible second…)—making TAPE that (not-so-essential) [Start-of-semester purchase]. Wrong. Brendan claimed last Thursday’s themed puzzle was easy and that today’s themeless is hard. My solving time on this one is 8 seconds slower than on the “easy” one. I hereby declare that both of these puzzles are of medium difficulty. Hey! Look at 5d. [Sporcle offering] is, of course, a TRIVIA QUIZ. I just sent @sporcle a tweet to let them know (with a link to Brendan’s site). Will they retweet it to their 4,462 followers? I hope so. Pretty smooth fill for a 64-worder. Wondering what ESTOPS, ESTEE, ASLOPE, and JILTER were doing there? Getting all the superior stuff to fit, that’s what. They’re not sought-after fill, no, but they’re acceptable. PABST and PAPA DOC, together again. The old RADIO ERA atop DOUG E. FRESH. Do you know I was this close to claiming last weekend’s Newsday “Saturday Stumper” was by Doug “E. Fresh” Peterson? True story. Have you ever had KIPPERED NACHOS? They’re delicious. MAUNDY Thursday has the best name of any sort of holy day, doesn’t it? It’s the MAUNDY. Looks like an adjective, but has no apparent use aside from that one Thursday. I dunno. I’m in kind of a maundy mood this morning. DR. PEPPER, CASH BAR, LIFE OF EASE, and JULIENNE are also bright spots in the fill. 25a. [Feature in a rainbow and a cake] is the LONG A sound. 43d. DESI [___ food (chicken tikka masala, saag paneer, et al.)] is a great non-Arnaz clue for DESI. A desi is a person of Indian, Bangladeshi, or Pakistani descent who lives abroad. If it weren’t for desis, I would have no idea that samosas and channa masala existed, and that would be a damn shame. This entry was posted in Daily Puzzles and tagged Aimee Lucido, Brendan Emmett Quigley, Jeff Chen, Lynn Lempel. Bookmark the permalink. Make that three fun puzzles! Very smooth, all. Congrats to Ms. Lucido on her BROWN debut, well done! Jeff Chen’s B and B was amusing, and I loved Lynn’s “Outside Chance” ranging from CHAIN OF EVIDENCE through CHANGE OF PACE and CHICKEN DANCE to CHERBOURG, FRANCE… The harbor of that last one tied in nicely with Cousteau’s OCEAN, even if one might have guessed La Mer. My only faux start was Sneer and Snide before SNIFF, LOL. Loved Aimee’s debut. Hope she has more ideas up her sleeve. Agree that all three puzzles made for a smooth start to the week. Only frown: Is “DJED” really a word? Deb Amlem, medical version of the more standard sphinter, Amy wrote medical speak.